Cisco has denounced the U.S. government’s interception of hardware delivered by the company to customers after a photo surfaced this week showing federal agents planting a tracking device in one of its routers. The National Security Agency’s practice of intercepting packages containing hardware as they are being delivered to customers — a procedure it calls “interdiction” — was first noted in classified documents released last December by Der Spiegel and journalist Jacob Appelbaum. But the photos released on Tuesday by journalist Glenn Greenwald of The Intercept offered the first visual evidence of the NSA’s secret operation in which it intercepts and opens packages, removes hardware and implants tracking bugs and beacons for purposes of surveillance and sabotage. 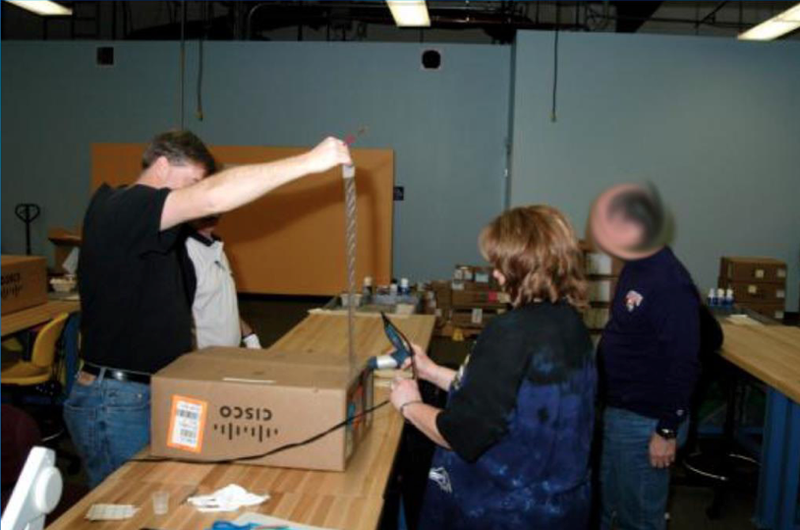 One photo shows four agents carefully removing packaging tape from a Cisco-branded box that contains computer hardware. Several other Cisco-branded boxes can be seen in the photo stashes throughout a room that appears to be part of a larger warehouse. The agents are described as belonging to the elitist Tailored Access Operations unit, the so-called “hacking arm” of the NSA. The agents are tasked with “getting the ungettable” from targets the NSA deems worthy of surveillance. Another photo released Tuesday shows just how TAO agents get such material. The photo depicts a “load station,” presumably at the same warehouse, where agents implant beacons and other spy gear into intercepted hardware before it is repackaged and shipped to the intended consumer. According to documents released by Greenwald, the NSA says such interception is possible thanks to the “support of Intelligence Community partners.” If Cisco is one such partner, they have made a concerted effort to conceal as much. But Chandler stopped short of saying Cisco was kept completely in the dark about the NSA’s interception of its packages, nor did the executive say whether Cisco was complicit in intercepting packages of certain customers under secret programs that the government says are legal. The photos were published on Tuesday in tandem with Greenwald’s new book No Place to Hide, which details the journalist’s meeting with Edward Snowden, a former government contractor. Snowden is said to be Greenwald’s source for dozens of reports on secret government surveillance programs backed by thousands of classified documents that he collected during his employment at Dell Corporation and Booz Allen Hamilton.